Now for the dark side of hospitals, creeping – no galloping - privatisation of our NHS and what it means in reality. As I have already reported Serco, 'serves many community services, including hospitals, the military and prisons.' Oh and controls the Flyingdales early warning system in Yorkshire. It also runs Yarls Wood women's immigration detenton centre. The company was referred to the Serious Fraud Office for overcharging the Ministry of Justice for the electronic tagging of prisoners there and in other 'holding' facilities. When the women went on hunger strike in March 2018 their supporters left decaying food on the steps of Serco's London HQ as an act of solidarity. The company has since struggled to win new work while losing a series of contracts including a deal to manage the Docklands Light Railway in London and run a New Zealand prison amid allegations that staff were running “fight clubs”. Meanwhile Serco food here at Barts is, well, a mess of mash. I have started chosing sandwiches as an option; today's tuna lunch, shrouded in white chemical bread. It would not cut much into Winston Churchill's grandson and Cerco CEO, Rupert Soames' £850,000 annual salary to use a half-way decent roll. Serco employees at Barts are excluded from the limited protection of NHS pay agreements and receive less than £10 per hour. Serco should be thrown out of our hospitals and food should, once again, be treated as central to health and getting better. It must not be a means to enrichment for Soames and his wealthy cronies. 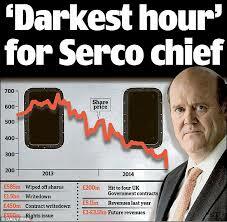 Qustion for Serco's CEO. What did you eat for lunch today Mr Soames?